Got to spend some time with the grandson today. I was shocked to find he had grown a thick, lustrous mane of dark hair. He’s only 6 weeks old! He’ll have a full beard at 4 months at this rate! 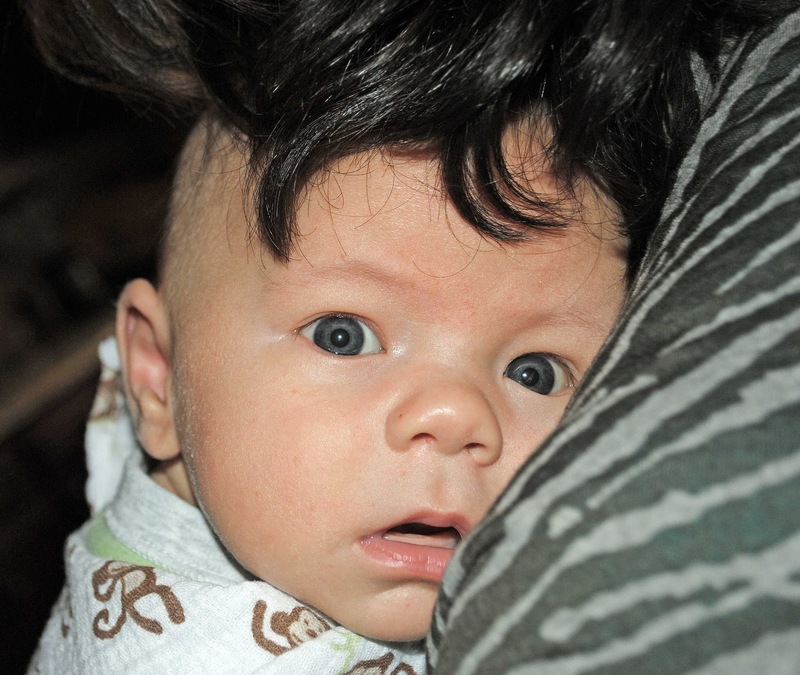 Is Mom slipping you some Rogaine?? Naw….I’m pullin’ your leg…..that’s the Sprout’s lovely long hair cascading down his forehead as she holds baby G. He looks handsome with dark hair….yes? 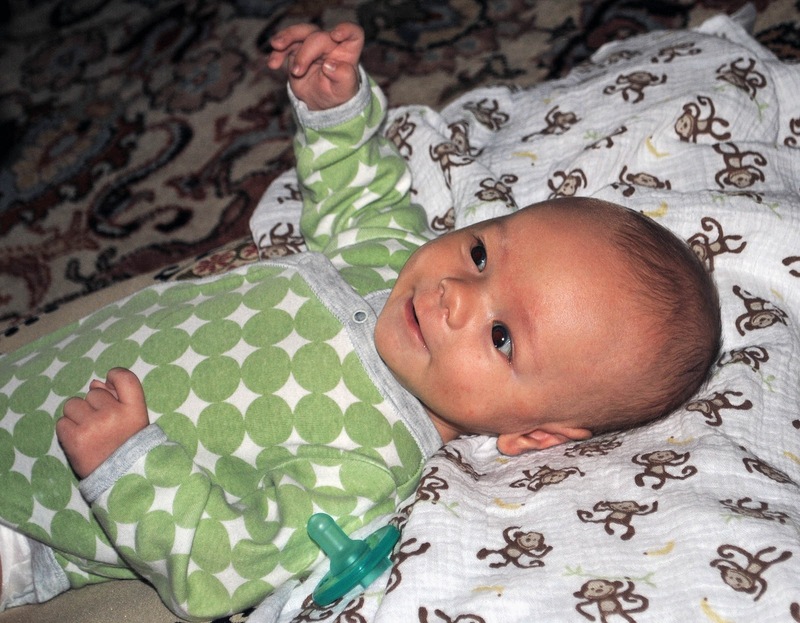 I got to hold him and talk to him and ‘mobilize him’ (got him a musical mobile) and kiss him and change him. It was loads of fun. 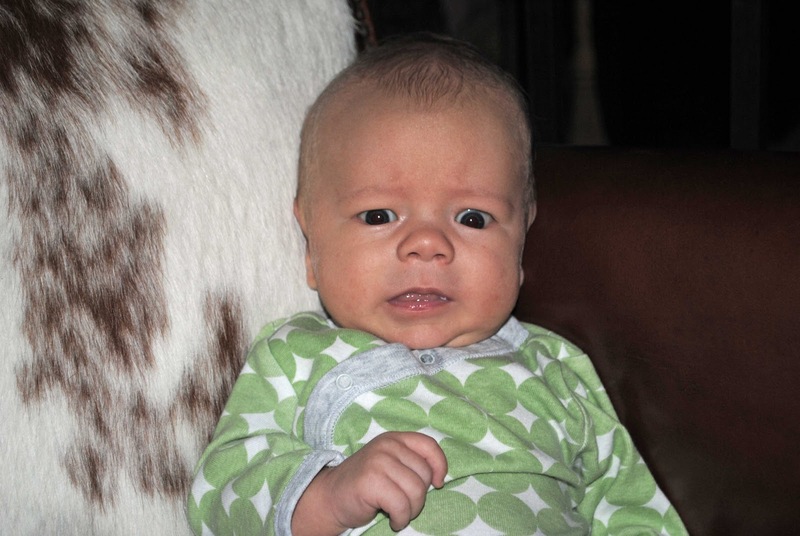 I had forgotten how quirky the infant ‘mood’ can be. Are you wet/dirty or do you just depise cowhide?? This is TEXAS, baby! Does this mean you’re going to be a vegan? Allright, sweetie….I’ll save you from the awful cowhide pillow. 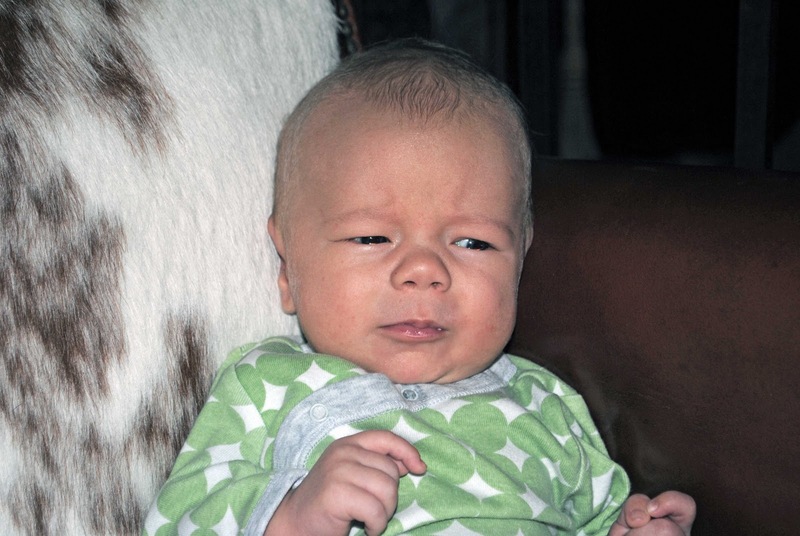 I love spending time with baby G. He’s ‘seeing’ things now and he likes to babble at me. 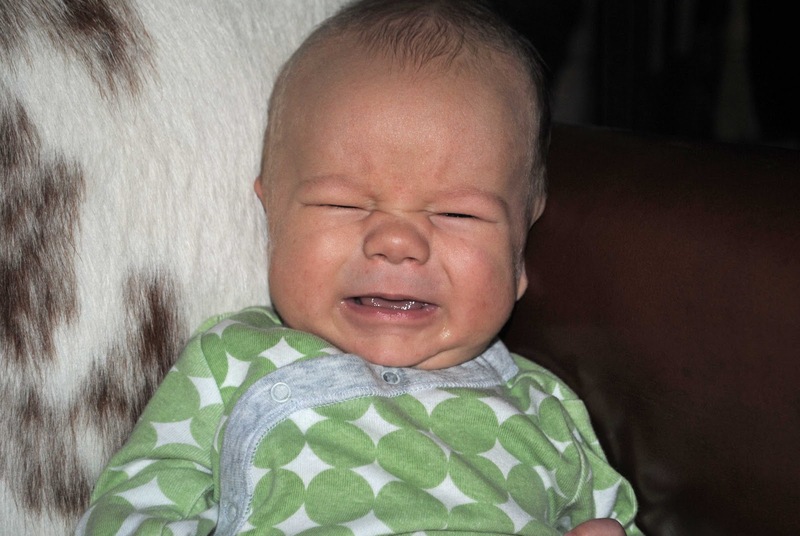 ﻿Babies are amazing and exhausting. The Sprout is doing great and she has the energy of a million women! God knew what he was doing when he gave babies to the young. I’m relearning some skills, but one thing I know for certain. I’d jump through flaming hoops for one of those baby smiles. 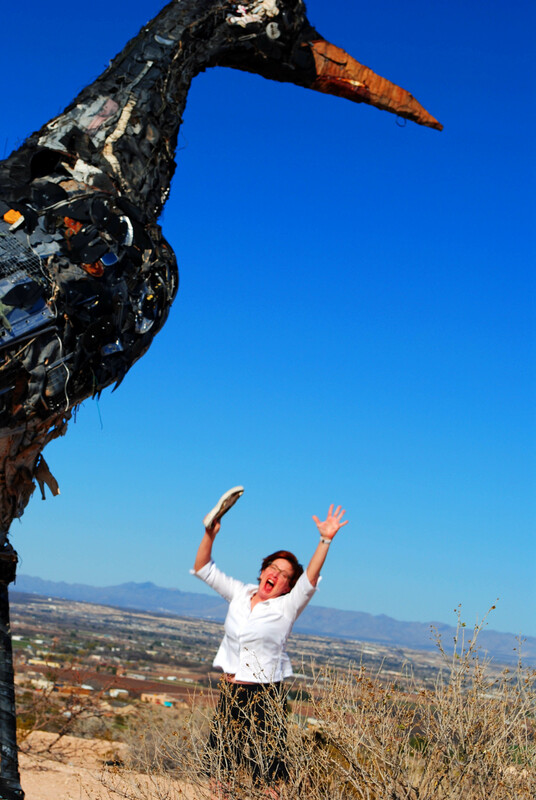 Hope this week leaves you grinning. Lustrous locks love to all. Discovered these photos and thought I’d share. 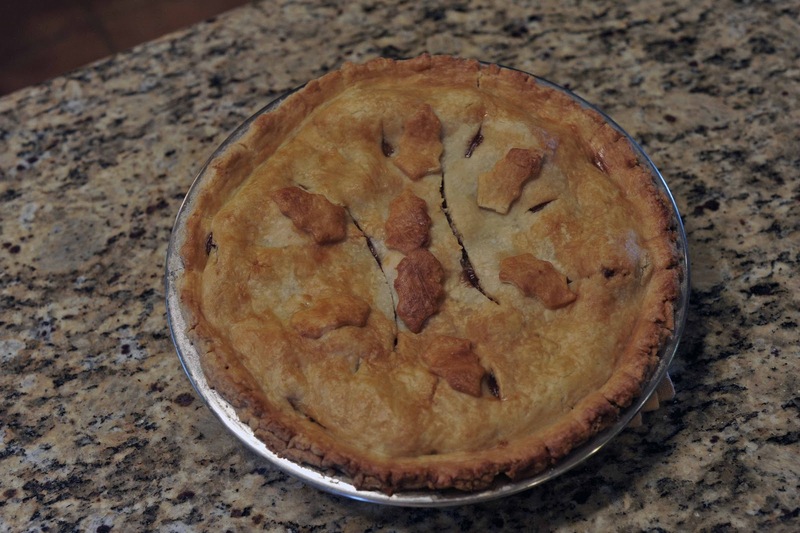 A big success this weekend: made an apple pie with a homemade crust! OK…maybe it doesn’t look THAT beautiful. Those are decorative leaves on the pie, people! I was possessed. Had. to. make. apple. pie. I’ve never been a very successful pie maker….my crusts taste like salty boot leather. This time out, I utilized the nifty food processor to mix (not too much!) the fat and flour. I used mostly butter (with just a dab of the wonder-ingredient Crisco) for this pie crust. I rolled it out between 2 sheets of parchment paper. The crust was flaky, delicate and delicious. How could it not be wonderful with 8 gallons of butter? I waded through puddles of flour and toiled for hours wiping the embedded white stuff off the deco-molding on my 1960’s kitchen cabinets. Probably won’t be making pie again any time real soon. Now for failure. 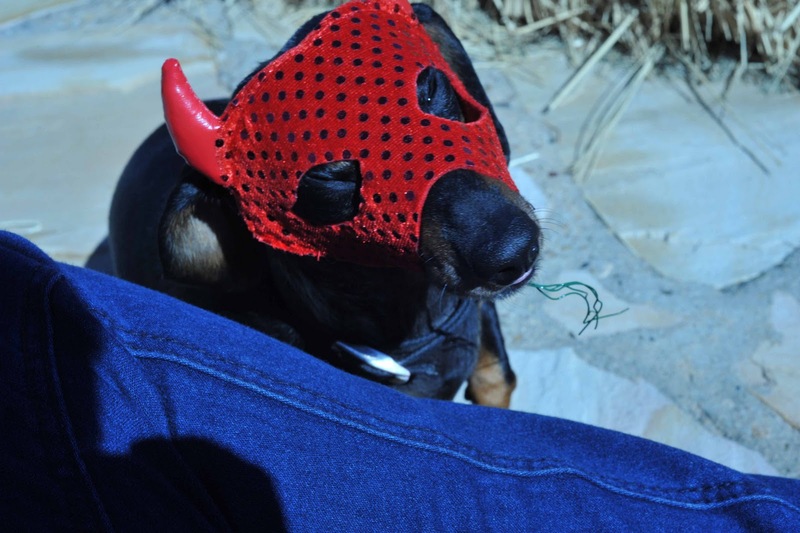 I wanted to bring you…my valued chicken-wing reader…an adorable Halloween post. Something to tickle your funny bone and get you into the spirit of the wicked holiday. 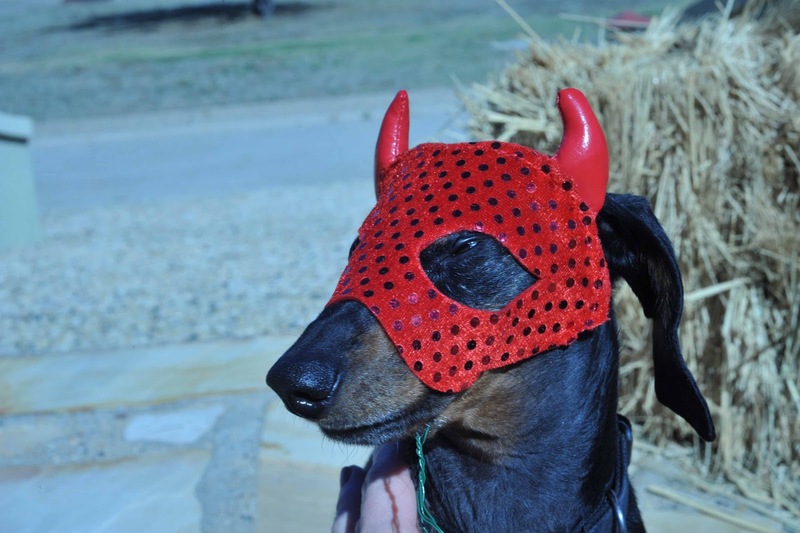 Yes….I was going to bring you the fearsome-ness of……….. I know…it was midday and the harsh light was unflattering. I know better. Something is making me uncomfortable. 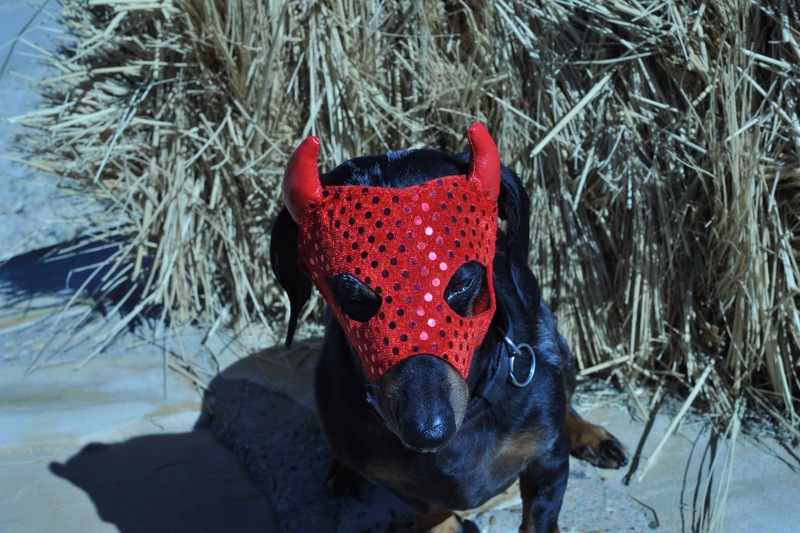 But I found this devil mask at the local walmarts and just HAD to show it to Roxy Doxy. Hello?! Notice the slanted right eye! 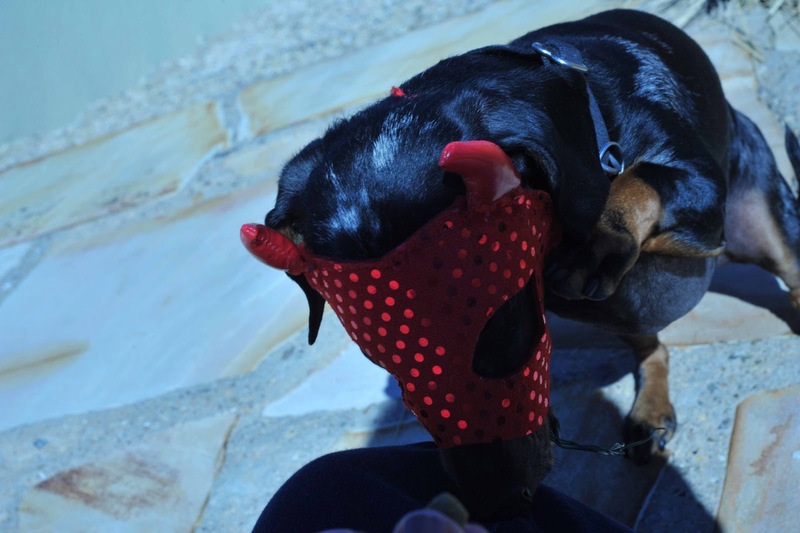 No good…..
﻿ Have you ever noticed doxies have rather long, narrow faces? I’ll pry the stupid thing off with my very own paws! 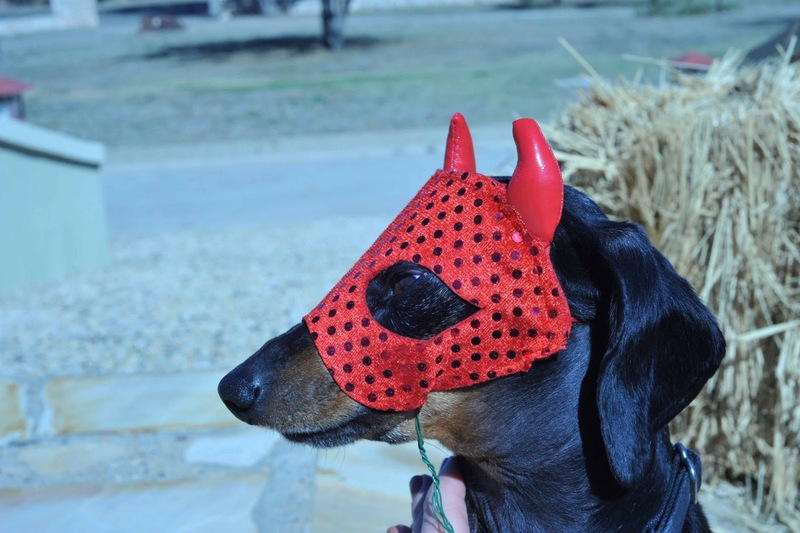 The satanical mask was grossly too wide for Doxy’s petite face….so I worked on it. There’s a reason it’s called floral wire….it’s for FLOWERS. Using available floral wire, I simple poked a couple holes in the bottom portion of the mask and twist-tied the wire around her snout. Why couldn’t I have the Kim Kardashian custume?? Perhaps I turned the twisty-tie thingy a smidge too tight?? 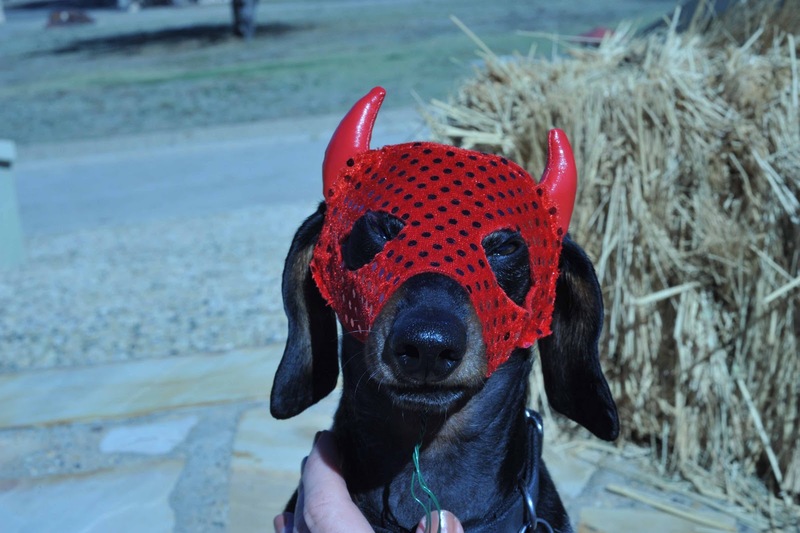 No amount of treats is worth this humiliation. Big, mega FAIL. 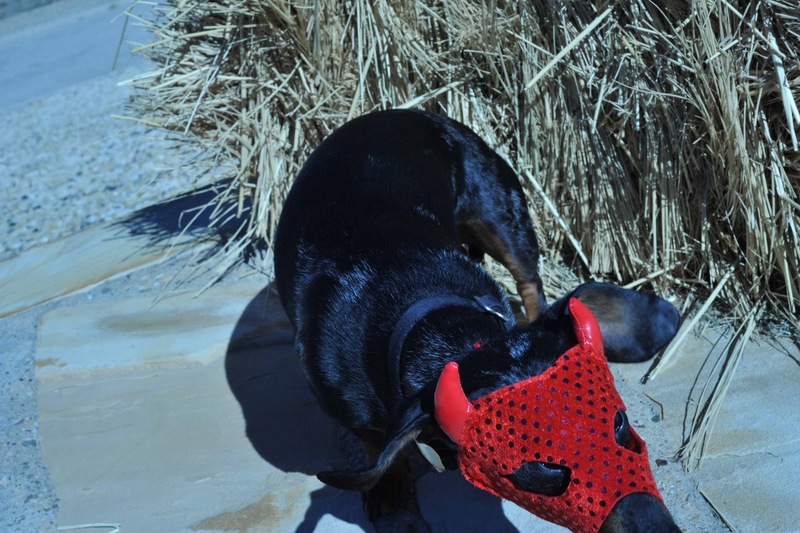 If it’s not Kim Kardashian or Lady GaGa, Roxy Doxy wants no part of it. Don’t feel too sorry for her. 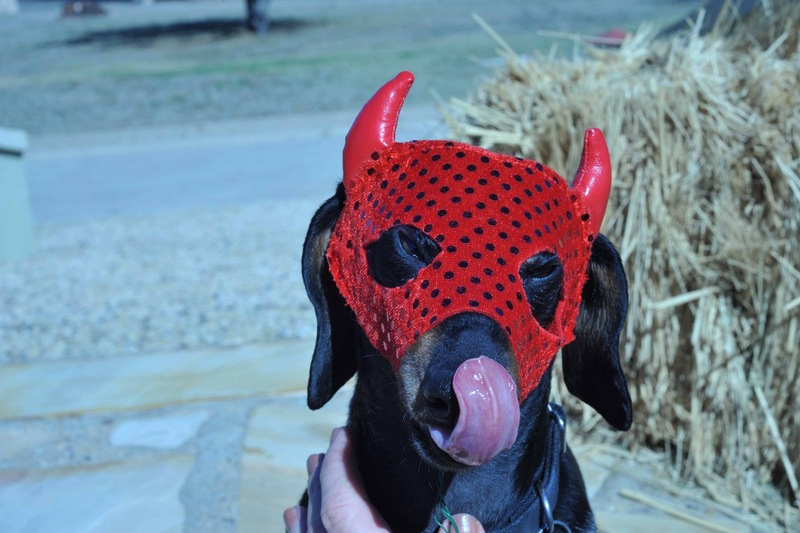 After the unsuccessful Satan photo shoot, I let Doxy engage in one of her FAVORITE activities. ﻿You guessed it! 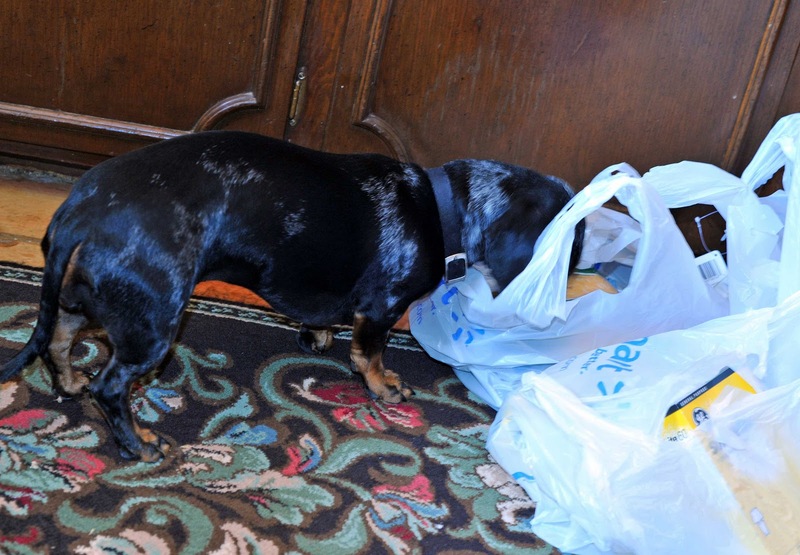 Sniffin’ out the walmarts bags for a special doggie treat! Of course, she found one. Enjoy your successes and learn from your perceived ‘failures’. Oh…and it never hurts to add PLENTY of butter.